From the late eighties through to the present day, The Bud Collins Trio has created a multi-hued and wildly difficult to categorize catalog of original alternative progressive music, and played throughout New England and across the US at indie clubs, colleges, galleries, festivals and other venues. Always impossible to pin to a genre, the Bud Collins Trio were frequently spoken of as an “alternative to the alternative”. Their music explores genres as diverse as jazz, instrumental, electronic, “chill”, progressive pop, world music, cinematic and environmental\ambient. Among other inauspicious activities, they appeared on MTV’s basement tapes (Fisticuffs, 1990), and played on the grass courts at the Tennis Hall of fame in Newport RI at the induction of their namesake, tennis great and TV and print journalist Bud Collins. 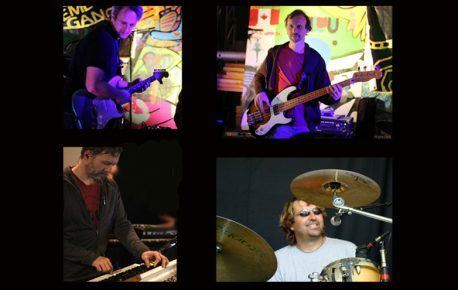 They have played with many well known acts of all kinds, from Bob Mould to Maceo Parker, from Monks of Doom (Camper Van Beethoven side project) to Blues Traveler and Sleepy LaBeef. For all of 2017, the Bud Collins Trio has dedicated 100% of all proceeds from live performances to social causes of various kinds, including both local and national interests and charities that benefit people in need from all walks of life, and efforts that promote human rights and sustainability. The intelligent and positive music of the Bud Collins Trio is always a treat for the sophisticated and thoughtful listening audience. XTC, Pink Floyd, Steely Dan and Brian Wilson have a hole puncher fight in zero-G.